Whether you need stand-alone CPR training, basic life support CPR, re-certification or a private infant CPR course, VFA is your best selection for training in Coquitlam, B.C. Vancouver First Aid (VFA) has been providing food safe, WHMIS, TDG, Mask Fit testing, food safe and first aid, CPR and AED courses throughout the Tri-cities area and lower Mainland since 2008. Over 30,000 people have registered for training with this provider since 2010. This provider has a new training centre offering a range of CPR courses in Coquitlam, B.C. opening in the Summer of 2016. For more information about available courses and the other providers in Coquitlam read through the following page. 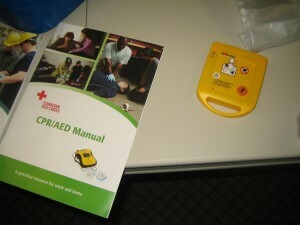 Participants registered for a CPR course with receive a Red Cross CPR Manual. Where Does VFA Rank Amongst other Major CPR providers in Coquitlam? ￼￼Three Red Cross providers offer CPR courses in Coquitlam, B.C. Here’s a ranking from top to bottom based on the number of courses offered per week and based on price. Vancouver First Aid (VFA) – This Red Cross provider offers at least 12 CPR courses throughout an average month at the Coquitlam training centre with an average price per CPR course being 60 dollars (including tax). Safe and Sound – This Red Cross provider offers approximately 8 CPR courses throughout an average month. This Coquitlam based provider has an average price per CPR course of 80 dollars (including tax). Valley First Aid – This Red Cross training provider offers approximately 1 CPR course pre month with an average price of 75 dollars (including tax). VFA offers the most convenience with it’s high number of courses and location and lowest prices. Selecting them for your next CPR course is a no brainer! To register for any course you can contact the customer service representatives by telephone using the phone number posted above. They are available 7 days a week for 12 hours a day. Customer’s can also register via on-line chat on the website, email and through on-line registration which is available 24 hours a day. They also provide free cancellation and transfers from courses as long as 72 hours notice is provided. Learn to save a life, learn the latest ILCOR CPR standards, build your resume and get certified via the Canadian Red Cross by registering for a CPR course in Coquitlam B.C. today.